Give your favorite dishes and drinks an extra citrus splash with this premium lemon juice! This convenient gallon of lemon juice will keep your kitchen in great supply, while eliminating the need for slicing and squeezing whole lemons. Cut your kitchen prep time in half and add a dash of this lemon juice to any signature recipe, marinade, or dipping sauce. Perfectly sour and tangy, the crisp citrus taste of lemon is needed for signature bar drinks like lemon drop martinis. Lemon juice also enhances non-alcoholic drinks like iced teas. This is the best lemon juice I have ever bought and it freezes nicely which shocked me normally freezing lemon juice changes the flavor but this one stayed the same .I just put some in a small container to use and put the gallon bottle in the freezer until I needed the rest. Very high quality product.I never buy anything different. This is good lemon juice for the price. I have mostly made lemonade out of it. It has worked out well for me. It has minimal pulp and great taste. Our employees love using this for their teas. We decided to buy the gallon for them because of the cheaper price since they were using all our packets that we give to our customers. We could easily put this in a pump and use it for drinks and are considering doing that. This lemon juice is great. No juicing lemons and removing seeds - just open and pour - from lemonade to lemon pudding to other delicious desserts - all good. This lemon juice concentrate tastes great! It is a concentrate so do not forget to dilute it or it will taste very harsh. It is great to have behind our bar. We use a lot of lemon juice, was using REAL brand lemon juice for years, tried this a few months ago and it was the same, not tart like some knock off juices. I was skeptical about this product, considering it is a quarter of the cost of the lemon juice we were using. Turns out to be a great replacement for our use in tarter sauce. We use this in our products and would recommend it to anyone. For the price, the value is very accurate. This lasts us long enough and goes far enough that we only purchase every now and then but will purchase again. I mainly use this to add a little lemon flavor to our black tea. It tastes great and saves a lot of time compared to slicing lemons. It was a great price for good quality lemon juice. It had a good flavor and small amount of pulp. I use it for dressings and sauces. I would recommend. This lemon juice is perfect to make lemonade with. We use it mixed with water and our own raw honey for a refreshing beverage! Great product! We use this lemon juice is all of our lemon based bakery items. It works just as fine as the name brands and great price. Good quality and good price for this product. We use this lemon use to make our own sour mix. Does not have the bitter taste as other lemon juice gallons. The lemon juice in wonderful and perfect for making refreshing teas and lemonades. The taste is terrific and very good potency.. The price is unbelievable. . I use it to make endless recipes at my school of culinary arts with lemon chicken, salad dressings, and for many alcoholic and non-alcoholic beverages. This at a very good price comparing it with a distributor and / or supermarket. It has great flavor and good quality. Can never go wrong with lemon juice in the kitchen. I use for a bunch of different recipes. Item arrived in good condition and packaged well. This lemon juice is offered at a great price and excellent for daily usage in dishes as well as drinks. I make my own specialty drinks and this gallon of lemon juice definitely came in handy. BEEN ORDERING THESE FOR A FEW MONTHS NOW. EACH TIME IT DOESNT DISAPPOINT. COMES WELL PACKAGED AND SEALED. WE USE THESE TO CLEAN OUR GRILLS AT THE END OF THE NIGHTS. WILL ORDER AGAIN! This product is a fraction of the cost to my previous lemon juice I was purchasing from my food distributor. We use it in our cocktail sauce and you cannot tell the difference. This lemon juice is great for our restaurant. We use it for flavoring some desserts and table use. Highly recommended and will definitely buy again. Great product for what it is. It's made from concentrate but for the price its unbeatable. It came shipped good with no leakage, will definitely order again. product is great! Just exactly what we needed for our restaurant. Will reorder when we are ready. Great for making cocktails and different drinks. Thanks! Top quality lemon juice and very tart. Great for making fresh lemon cocktails with this great juice. A nice price for a gallon and heavy duty plastic jug. Great tasting lemon juice. Has just the right amount of acidity and tartness to flavor drink mixes, pies, cookies and many other things. Recommended for sure! A great bulk jug of lemon juice that is great for making our homemade cleaning supplies. The acidity level is great and has a great smell. Great for cooking as well. 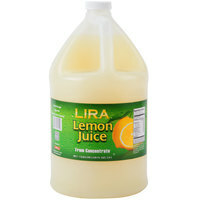 A lovely gallon jug of lemon juice that is great for making fresh lemonade. The juice is very pungent and has a great fresh taste. A very good value for a gallon of lemon juice. The juice is a great quality and has a true lemon taste. It is perfect for making lemon iced tea. Nice and tart taste that is comparable to any high end brand. It can be used for lemonade or as an add in for any cocktail sauce. These great juices are comparable to the private labels available from your distributor, or any of the nationally recognized brands for a fraction of the price! This lemon juice is great for adding to sauces or pie fillings. Perfect for keeping apples from browning! Got these for my husband mostly, he loves to makes different combinations of lemonade and by seeing that half the gallon is already gone in a couple of weeks, I got to say he loves it! A very tart and fresh lemon juice that is perfect for making homemade lemonade. The juice also saves time from us having to squeeze all the lemons ourselves. Great product with a nice taste and lasts a long time. We used this to make a base for our fresh squeezed lemonade and it was a big hit. What a great buy. Webstraunt pricing is 30% of the cot of our local source and the quality is great. This is why we use Webstraunt. Get ready to pucker up with this fresh tasting lemon juice. It is perfect for mixing cocktails and making lemon drop shooters. A great value and a great taste. We use this lemon juice in many of our dishes as well as adding flavor to our sauces and recipes! Adds a great extra boost of flavor! Great bang for your buck and the container is perfect for keeping your kitchen organized. This is an economical option compared to the brand-name lemon juice products out there. It worked well for my needs, which included making a fruit wine and using this juice as the acidic base. At first I wasn't sure that I would like this particular brand, but you can't really tell. It works just as good and the flavor is there almost the exact same as other brands! This 1 gallon lemon juice is extremely convenient to have on hand. While making large quantities of homemade dressings and marinades we have discovered this is the best option! Great bang for your buck! This lemon juice is perfect for my needs! I make a lot of lemonade and this has a good flavor, lasts a long time and is a great price. Great price! I use this to make my lemon meringue pie and also made lemonade with it. The flavor has kind of an off note to it. A great product and taste just like the name brand ones. We use this in alot of our mix drinks and for cooking various dishes.